eggless mango muffins recipe - easy whole wheat eggless mango muffins recipe. peel and chop 1 large alphonso mango. add the mango cubes in a blender. in cup measure, it should be 1/2 cup tightly packed chopped mangoes. if using store bought mango pulp or puree, then use 1/2 cup mango pulp. you could also use any juicy mangoes instead of alphonso mangoes. also add 3 to 4 tablespoons sugar. the addition of sugar depends on the sweetness of the mangoes. the mangoes i used were just sweet, so i added 3 tablespoons of sugar. if the mangoes are very sweet, you can add less sugar. also add seeds removed from 3 green cardamom pods and 1/8 teaspoon of nutmeg powder. you can also add 1/2 teaspoon vanilla extract instead of cardamom and nutmeg. this is an optional step. add 1 tablespoon dried rose petals. you can skip adding if you do not have rose petals. blend to a smooth puree. keep the puree aside. place the muffin liners in the muffin pan. also preheat your oven at 180 degrees celsius/350 degrees fahrenheit 15 minutes before you start baking. for baking in the convection mode of the microwave oven, use 170 degrees celsius/330 degrees fahrenheit as the preheat temperature. take 75 grams unsalted butter or ½ cup roughly chopped chilled butter in a pan. keep the pan on a stove top and on a low heat melt the butter. stir while the butter is being melted so that the butter melts quickly. just melt the butter. no need to heat the butter. keep the pan down once the butter has melted. add 1/2 cup sweetened condensed milk. about 125 ml condensed milk. with a wired whisk, begin to stir very well. now add the mango puree. mix again very well. now take 1 cups whole wheat flour/atta, 1/2 tsp baking powder and 1/4 tsp baking soda, a pinch of salt directly in a sieve. seive directly in the mango mixture bowl. you can also seive the dry ingredients separately in a plate and then add the flour mixture to the mango mixture. with a spatula fold the dry ingredients into the wet ingredients. with light hands, gently fold. do not over do. the batter should have volume and should not fall flat or become doughy like chapati atta. depending on the quality of flour, you might get a thick batter like i have got. this much thickness is fine. but if the batter looks very thick, then do add some tablespoons of milk. also mango puree made at home is usually thick. if you use store bought mango puree, then the batter will be slightly on the thinner side. folding is the most important step and can make or break your mango muffins or cake. so do it properly. with a spoon or a small spatula, add the batter in the muffin liners more than 3/4 volume of the liners. gently even the top with the spatula. place the muffin pan in the preheated oven at 180 degrees celsius/350 degrees fahrenheit. bake mango muffins for 30 to 40 minutes. in an OTG or regular oven, preheat as well as bake with the lower heating element on. if top starts to get browned, then cover with foil or butter paper and continue to bake. depending on the temperature conditions in your oven, it may take less or more time. it took me 35 minutes to bake the mango muffins.for baking in the convection mode of a microwave oven, use the temperature of 170 degrees celsius/330 degrees fahrenheit. again the baking time will vary in the convection mode of your microwave oven. the final check is a tooth pick or wooden skewer coming out clean from the mango muffins. after 3 to 4 minutes, remove mango muffins from the pan and place on a wired tray. let them cool. 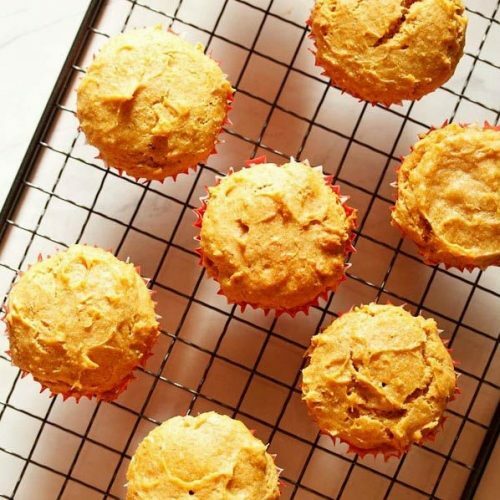 serve these mango muffins as dessert or a sweet snack.